The little stack of hats for Swaziland has now grown from four to fourteen. I think I should just stick to the regular hat shape if I make more of these, because the square ones are sort of naff! Since the BIG project was finished, it’s been a relaxing time of churning out these little hats each time I picked up a hook. 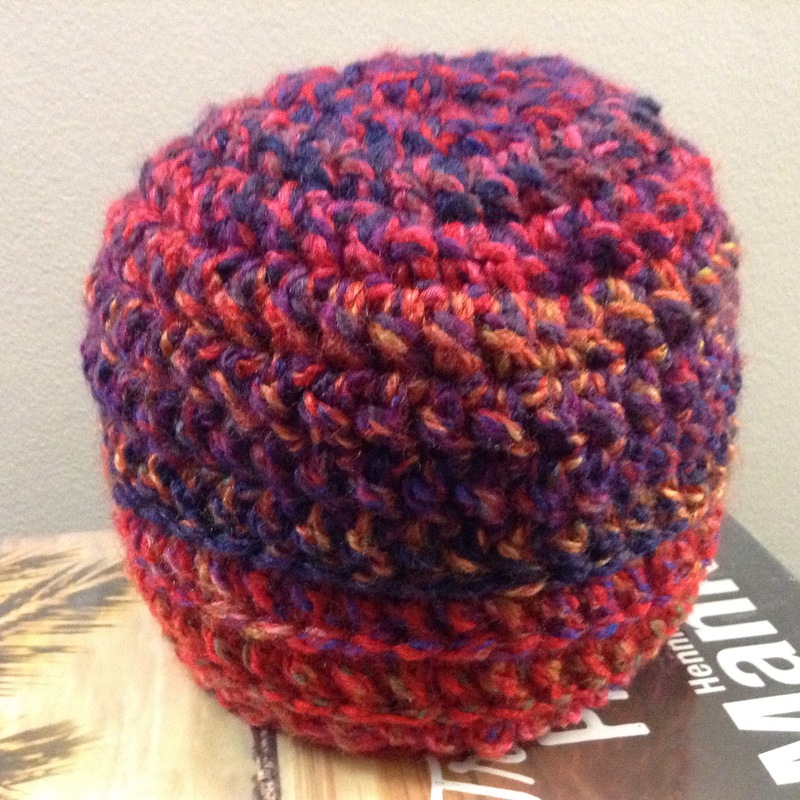 And there’s been another hat – an adult-sized one for a co-worker’s husband. This is a very manly hat using James C Brett Marble Chunky in MC59. Shades of brown and grey. The pattern is my Adjustable Crochet Hat (crochet hat recipe) pattern without any embellishments, and with an sc round at the end, and a 6mm hook. We’ve had quite the snow build-up this week. Today it’s milder so we’ve had some melting, but for a few days it was shovel, slither and slide. Yesterday I had a plan to go to a friend’s house for some energy healing, and I wanted to do some errands, like Costco, that I plan for when I go across the lake, but I did wonder whether I should just stay home. However I did venture out, and as long as I was careful not to accelerate or brake too sharply I mostly maintained my traction! I’m having a blissful day at home today – a friend came over and we drank scads of Yorkshire tea and got out our knitting and crochet and put the world to rights (well, at least our corner of it). Now I should probably get off my arse and go and bake a pineapple upside-down cake, because it’s on the meal plan, and leaving it until the last minute is not a good idea if we want to eat it for dinner. Probably should prep the shepherd’s pie too. I hope you’re staying cosy in your part of the world. Happy crafting! It’s been a blissfully uncommitted day today and I was able to enjoy a whole morning in my PJs doing nothing but join the squares of my granny square coat-of-many-colours, drink tea, eat breakfast, and throw in a couple of loads of laundry before the pile overtook the hallway. The sun was pouring in and I was able to get some naturally lit photos of the coat, firstly joined but still flat, then joined down the side and sleeve seams. The squares did get rearranged a couple of times. I thought I had it sorted, then was annoyed by two squares with a lot of raspberry pink next to each other. Move one square, and you end up moving six! 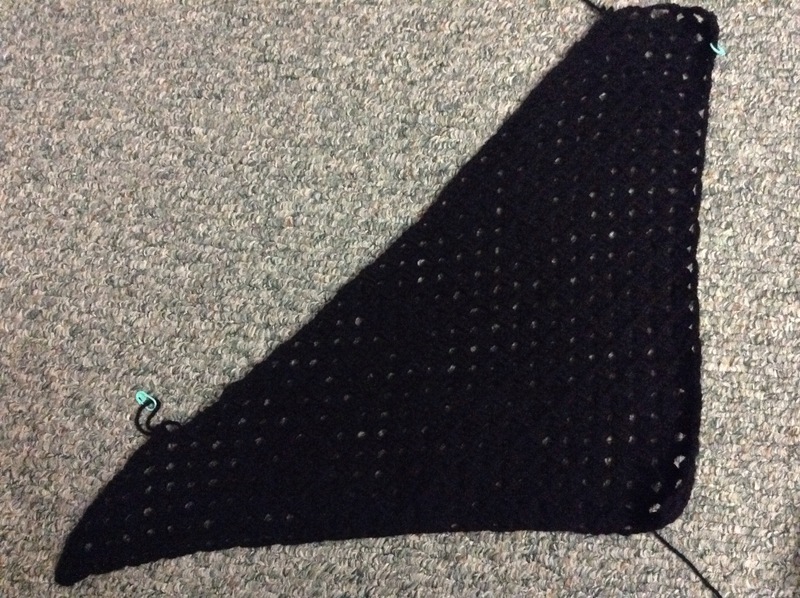 The seams are single crochet on the right side, working into both loops. Decorative and sturdy. SO many ends. At least 744 of them. Next up is to add the collar, cuffs and button bands. I will start on that tonight. I’ve decided to miss our usual Monday night activity and get more crochet done. Ds3 actually came out for a walk with me this afternoon. Weather was bright and cool and it was nice to see him get out of the house with his camera. One more thing to show you – a small portable project. A hat in progress with James C Brett Marble Chunky. I’m going to add a button tab just for show. It’s good to have something to work on while out and about when projects like the coat or a blanket get too unwieldy. 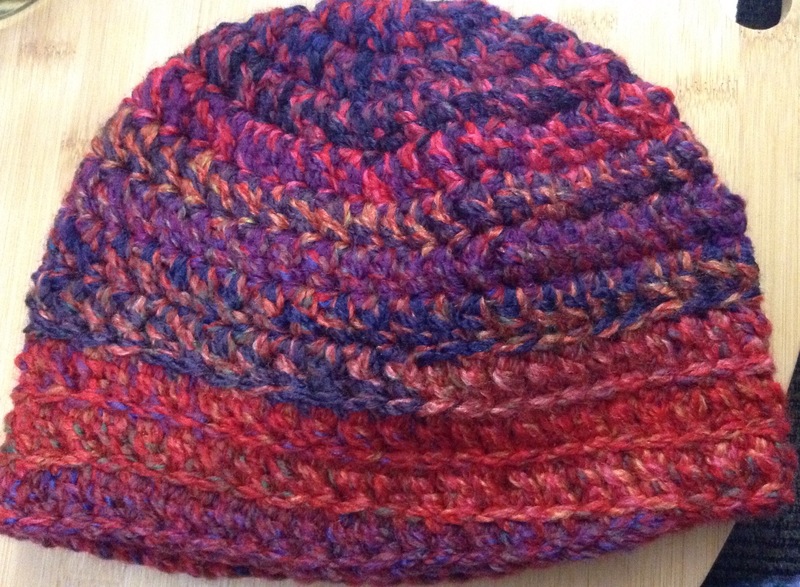 This is a really basic double crochet hat, worked in a spiral, based on my Adjustable Crochet Hat pattern. I found the yarn in a clearance bin at my LYS. I’ve always loved the Marble Chunky. Have a great day, and talk to you again soon.